The imagery of soaring eagles has inspired mankind for generations. 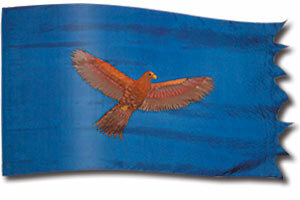 This banner portrays an eagle soaring across a dark blue sky. Its dark brown and tan plumage represents God's power and strength, which can be reflected in His people. It speaks of moving up against the storms of life, using them to go higher and being called by God to go even higher. The eagle actually appears to soar, circling over the head of the worshippers. The hovering, protective aspect is highlighted in this banner. The characteristics of this birds are frequently referred to in the Bible -its swiftness (Job 39: 28, 29; 2 Samuel 1:23), its building in high cliffs (Jeremiah 49:16), its powerful sight (Job 39; Deuteronomy 32:11), its great powers of flight (Proverbs 30:19) and its teaching its young to fly (Deuteronomy 32:11). Eagle, Judgement, Power, Protection, Redemption, Soaring, The Lord The Most High God, Wings.